We are pleased to announce that our Dart Vale Veterinary Hospital in Totnes has achieved RCVS ‘OUTSTANDING’ accreditation for the RCVS Practice Standards Scheme In-patient Care and Client Service Awards. The RCVS is the governing body for veterinary surgeons and the Client Service Award is only given to practices which demonstrate high levels of care for their clients. 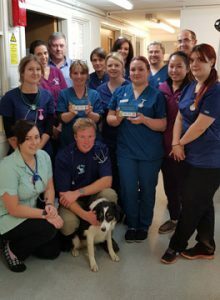 The outstanding In-patient Care Award also demonstrates the exceptional high level of care our clients animals receive when hospitalised in our hospital. This award is in addition to the RCVS Hospital Status quality assurance that the practice already holds.